Encompass K-9, located in Coquitlam, BC, is a distributed learning program that offers students from Kindergarten to Grade Nine unique full-time educational options tailored to the needs of each student and family. It provides small group setting support, self-paced learning and flexible scheduling. Encompass has a mission to ensure quality learning opportunities for all students working in partnership with teachers, students and parents. Wesbild was pleased to partner with Gemco Construction to support an art program at Encompass for the 2017/18 school year. Students participated in art lessons and a helped to create new permanent school mural thanks to the $8000 committment. 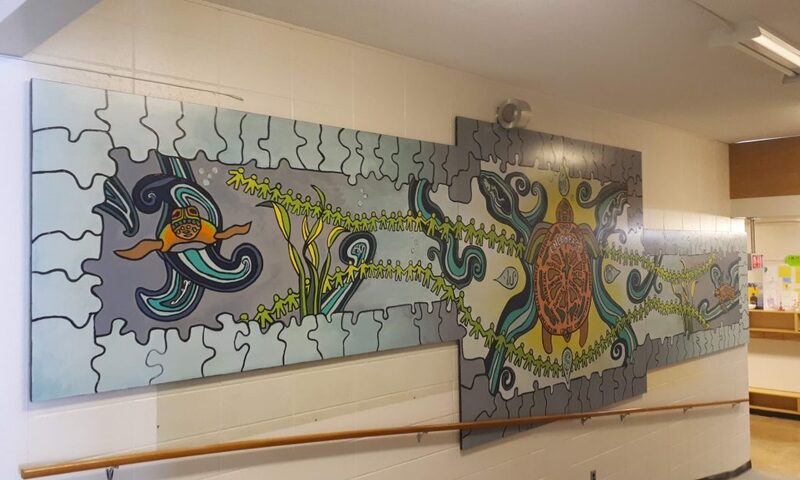 The lessons and mural project were led by Rosalynn Colombo, a local artist responsible for other school mural projects within in SD43. Students worked with Rosalyn to create their individual painted contributions to the project which combined to create the large mural. Art is important because it encompasses all the developmental areas in a child’s development. Wesbild was proud to partner with Gemco to help make this art project a reality.